The Campbell Hausfeld 6-gallon Quiet Compressor (DC060500) is designed to be among the quietest air compressors in the industry. At only 68 dBA, Quiet Compressors have the lowest sound levels of any air compressors we offer, so they can be used virtually anywhere — even in noise-sensitive areas. The oil-less, no-maintenance pump is among the key components that are designed to last up to four times longer than those of a conventional oil-free air compressor, so every Campbell Hausfeld Quiet Compressor is ready for a long — and quiet — life. This air compressor is ideal for a wide variety of projects: Use it for inflating tires, sporting equipment and pool toys; air nailing baseboards, trim, craft projects, upholstery, décor and art projects; air stapling carpet and craft projects; air brushing T-shirts, stencils, crafts — and much more. A high-quality, one-piece shroud protects users from hot and moving parts. Operates on 120-volt household current. 125 Max PSI, 2.4 CFM @ 90 PSI. Transforming a vintage headboard is easy with your Campbell Hausfeld Quiet Air Compressor. Watch for instructions. 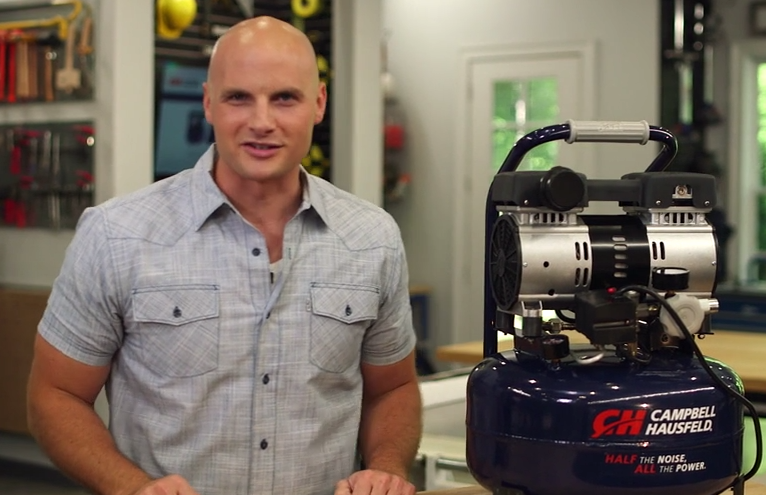 Step-by-step instructions for installing baseboards with your Campbell Hausfeld Quiet Air Compressor. Step-by-step instructions for building a vintage barn wood tray with your Campbell Hausfeld Quiet Air Compressor. An air compressor is a critical tool to have, allowing you to easily clean, maintain, repair or inflate items.